Chip Collins was one of those guys we all love to hate. He was a rich kid attending the prestigious Braxton College. He was a sports superstar, had women throwing themselves at him, and was pals with everyone in school. How could anyone not hate him? The stories in Chip Collins Adventures were typically about Chip winning the track meet, making the winning basket, scoring the touchdown in OT, etc ad nauseum. When not playing the Jim Thorpe role, Chip was busy with his extracurricular activities of foiling crooks and solving mysteries. The strip started as a replacement for Frank Merriwell's Schooldays, an essentially identical strip. 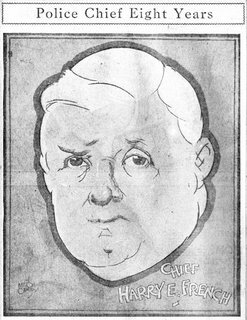 I'm guessing the syndicate (Central Press Association) decided that they could just as easily do the same strip without paying the licensing fees for this well-known dime novel character, and thus Frank Merriwell ended on 7/14/1934, and turned into Chip Collins on the following Monday. For more on Frank Merriwell, try here and here. 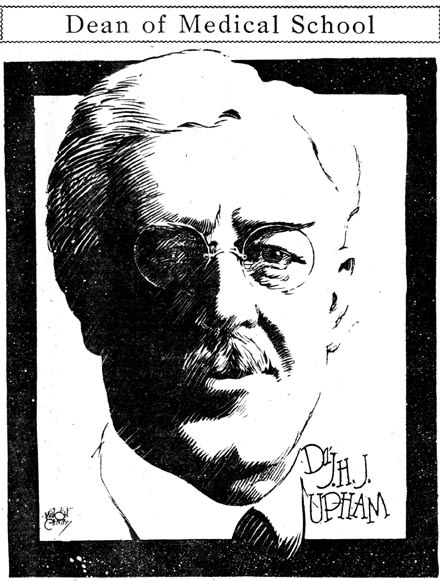 The strip was written by William Ritt (who may well have written the Frank Merriwell strip, too, but credit on that was given to "Gilbert Patten, the original Burt L. Standish". The art was by Jack Wilhelm, a good cartoonist who was especially adept at depicting lovely ladies. Unlike the Merriwell strip, Chip Collins got a Sunday version in addition to the daily. I say Sunday, but actually you'll find that these strips are dated on Saturdays. This is because they ran in the New York Journal, Hearst's second New York paper (the major Hearst strips ran in the Sunday New York American). The Journal published a color comic section as part of its Saturday edition. Whether it was because of the loss of the Frank Merriwell name, or the stories and art that often seemed rushed, Chip Collins had a short life. The Sunday (er, Saturday, okay to heck with that, I'm calling 'em Sundays) was killed as of the 6/15/1935 episode, and the daily ended 7/27/1935. Both episodes tried to wrap things up in their final panels, as seen above. A few items of note on these strips. Notice on the daily that the final panel is obviously not by Wilhelm. My guess is that the original version of the strip continued the storyline, so a bullpen artist was called on to redo the last panel as a series wrap-up. On the final Sunday note that the art is by Paul Frehm rather than Wilhelm. Unfortunately I don't have the Sundays leading up to this, so I don't know if Frehm took over earlier or just did the final installment (my next to last is 2/9/35, and Wilhelm was still credited there). This may be the key to why Chip Collins ended - was Wilhelm just too overwhelmed with the work? The art does certainly look rushed on much of the Chip Collins run. One final note before I let Chip Collins recede once more into the collective memory. The New York Journal sometimes (often?) dropped the Chip Collins Sunday for an ad. Given that the Sunday was not widely syndicated, if at all, was the Sunday even produced in weeks that it didn't run there? Does anyone have Sundays from other (non-Hearst papers)? Our final look at the Keane oeuvre concerns this cute little feature titled Eggheads. Apparently it started on 9/28/1981, and I've seen no examples later than 1982. However, a reprint book from Fawcett was published in 1983 that does not mention the demise of the strip, so perhaps it soldiered on a little while longer. Syndicated by Register & Tribune Syndicate, I regrettably did not even find this strip running in the home paper. 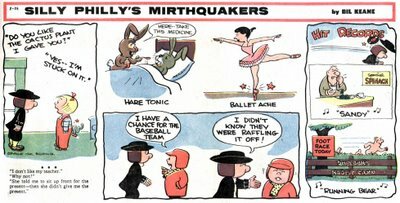 The humor of Eggheads abounds in puns and groaners, and the Mutt And Jeff style 'takes' in the final panel are a standard feature. According to the blurb on the book, Bil drew roughs and son Jeff Keane did the finished drawings. If the last four days of Stripper's Guide posts whetted your Keane appetite, hop on over to his website here. Great website. And they feature so many cartoons too. Working in television as I do, I found many Channel Chuckles that I likd. And if you look around at that site, you'll also find the Mirth-quackers, who are obviously related to these eggheads. 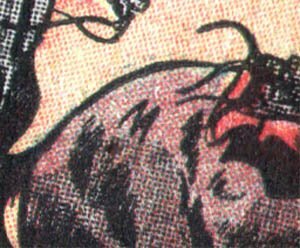 This is probably old news to you, but perhaps more recent readers can appreciate this: the website www.lileks.com has a small section devoted to old comics. His discussion of Jerry on the Job goes on in great detail about what he describes as that strip being the master of the "flip take"; i.e., when someone is knocked off their feet by the punchline. I like the little detail in Eggheads where the guy bonks his head on the top of the frame. But then again, I dig the meta-humor. 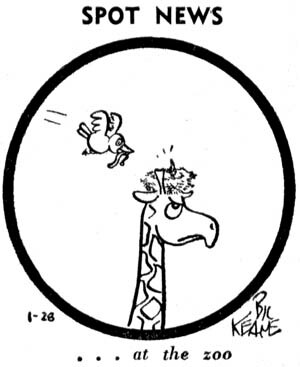 As long we're on a Bil Keane kick, let's keep it rolling with this feature called Spot News. This little 1-column feature, known as a filler in the biz, would have been marketed as a cute addition to the editorial page. The gags are topical but not editorial. The feature began in the Des Moines Register on August 3, 1959. Although I've never seen a sample with a copyright slug, I assume they were the syndicator since Keane's other syndicated cartoon (Channel Chuckles, see yesterday's post) was with them. The Register ran the feature on a space available basis (in other words, it only appeared when there was a hole to fill on the page). I have also heard this practice called ROP (run of press) by people in the business. The latest I've seen are from early 1960, and the feature was not listed in the 1960 E&P Syndicate Directory, which comes out in late summer, so I assume it didn't even make its one year anniversary. If anyone knows the specific end date, I'd love to hear from you. Tomorrow, one last keen Keane item. 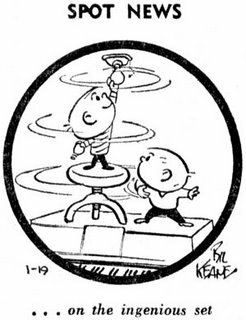 When the name Bil Keane comes up, naturally we think of Family Circus as his big success. However, he has actually had two big syndication hits. Recognizing that newspapers were getting into the TV show listing business, Keane created Channel Chuckles in 1954. The daily and Sunday panel series, which focused on television-related gags, was the perfect feature to add a little graphic interest to the otherwise type-intensive TV program listings. The feature was distributed by the Register & Tribune Syndicate. Keane's idea started a minor avalanche of 'me-too' features - Tee Vee Tee Hees, TV Laffs, TV Micro Funnies, The Vidiots and others have followed over the years, all trying to tap the same market. As seen above, Channel Chuckles was also offered as a Sunday color feature. Though it never had the popularity of the daily panel, it was a good fit for papers which printed a weekly TV Guide-style listing booklet. The Sunday lasted until about 1970, while the daily continued through 1977. A lovely feature. I didn't know it ran so long. Surprising that there weren't any pocket compilations. I hope someone will do an interview for Hogan's Alley with Bill Keane while he is still with us, so Tom can show a lot of this material. There was a reprint book, "Channel Chuckles" by Scholastic Books, published 1964. Geez, li'l Billy is *ev'rybody's* kid, isn't he? 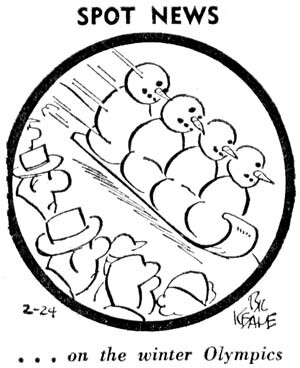 Before Bil Keane became an American institution with Family Circus, he was on staff at the Philadelphia Bulletin for many years, and produced the long-running local feature Silly Philly. The title character was a quaker, emblematic of the city of brotherly love. 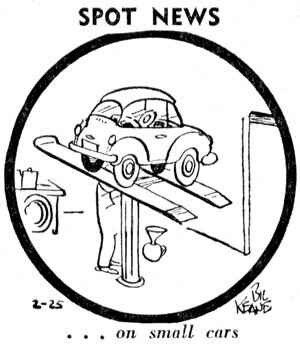 The feature started in the back pages of the paper's Sunday Fun Book on 4/27/1947. The Fun Book featured Will Eisner's The Spirit plus additional local features like Sports Stars and It's Philadelphia (both of which will probably pop up here eventually as obscurities of the day). The Fun Book eventually folded, and Silly Philly was promoted into the paper's regular Sunday comic section. There it ran until 9/3/1961. Presumably Keane decided to end the feature as the Family Circus gravy train started rolling. Actually I'm planning a post on Channel Chuckles tomorrow. Well, let me ask in advance then if there is a connection between the two syndicates and how and why he should work for them. Couple years ago, there was a "Family Circus" Sunday where Billy was watching "Silly Philly" on television. I think I still have that somewhere. 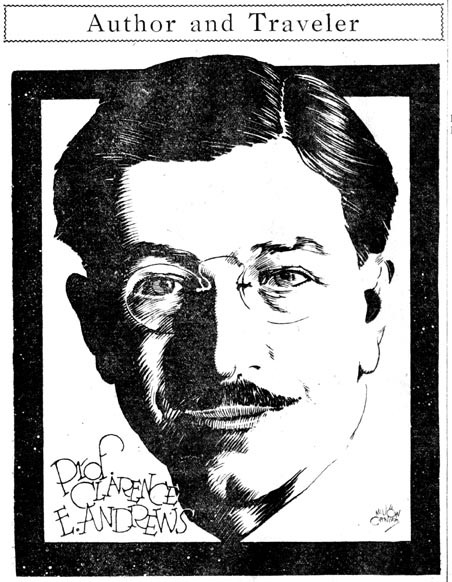 There is no connection between the Philadelphia Bulletin and the Register & Tribune Syndicate (which is based in Des Moines Iowa). Here's another batch of Milton Caniff items from his early days at the Columbus Dispatch. For more see this blog entry. The top four are portraits (well, duh) that accompanied biographies of these gents in the Sunday Dispatch magazine section. This was only one of the many and varied illustrating jobs Caniff handled at the Dispatch. 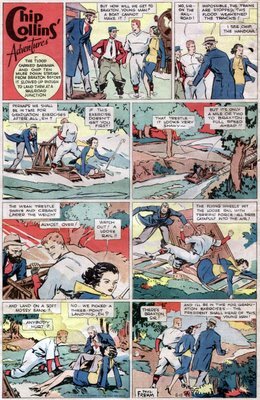 The Escapes From The Pen comic strip (later panel) was Caniff's longest running feature at the Dispatch. There were five discrete runs, punctuated, I gather, by him leaving the paper to get back to his school work at Ohio State University. The Roy Rogers strip was throughout its run offically bylined to Al McKimson. This name, I am told, is a pseudonym for the brothers Tom and Chuck McKimson (art and script, respectively). However, over the years I've gathered a number of additional credits from various sources. 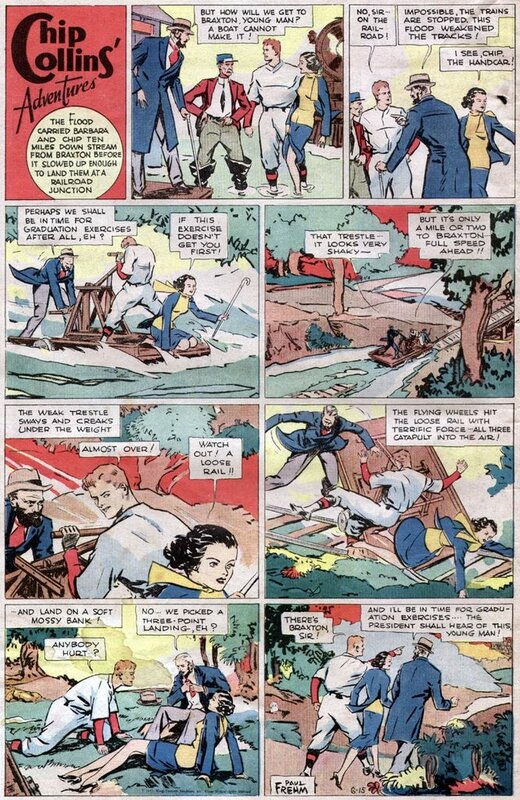 Being somewhat skeptical of art and writing style spotters, I'll just tell you what I've been told regarding the Roy Rogers strip and let you choose whether or not you take a grain of salt with it, as I do. Any additional information, or refutation of this information, is of course very welcome. One credit that is ensured is that of artist Mike Arens. He first started taking surreptitious credit on the strip on 5/10/1953, as can be seen in our sample. The detail view shows his monogram on the flanks of a horse. The monograms eventually changed to initials, and became less secretive. The art style on the Sundays doesn't seem to change on this date, so presumably Arens had started earlier, taking not even clandestine credit for his work. 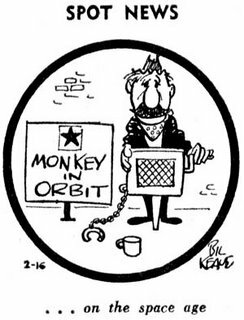 "The Al McKimson by-line refers to Western Publishing comics editors Al Stoffel and Tom McKimson. Chuck McKimson was not initially involved in the production of this strip (which began in December, 1949), as he was at Western from 1954 to circa 1963. Note that another Western Publishing-produced strip, Gene Autry, was by-lined "Bert Laws", from Albert Law Stoffel. Al Stoffel wrote, besides editing, some of the first few episodes, whereas he only produced the strip from 1954-61. Phil Evans wrote most of the strip from 1954-61, and perhaps even before that. Carl Fallberg wrote some continuities in 1952-53. Pete Alvarado probably drew the dailies and Sundays in 1949-50. Mike Arens started drawing dailies and Sundays in 1950. 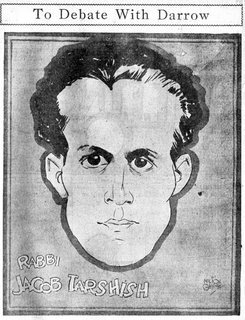 He drew most of the Sundays until the strip folded in 1961 (and he was allowed to sign them in 1955), whereas he alternated with others on the dailies. John Ushler drew some Sundays in 1950 (the one I have is dated March 19). Hi Mankin (he signed himself Hi, not Hy) drew the dailies in 1953-58. Alex Toth drew the dailies from Dec. 19, 1960 until Jan. 12, 1961." I've asked Alberto for his sources for this information so that we may be better able to judge the accuracy of the above. If you have one of those 1960 samples, we can probably tell if it Toth or not. I believe that there are Ken Ernst signatures on some of the 1953 dailies from the Lincoln Star (Nebraska). Is "Pate Alvarado" a mistype of Pete Alvarado? 1. Thanks, Buzz, typo corrected. 2. John, I can't imagine Ernst would have time to do both Mary Worth and Roy Rogers. Let's see some proof, buddy! 3. Sorry, Ger, my latest Roy Rogers tearsheets are from 1957. It's a pretty rare strip by then. Seems things are not as Pat as I'd thought. Ken's signature seems to have jumped the Dale between Roy and Mary Worth, so I'll bite the Bullet and say I'm sorry for being Trigger-happy. Pretty Sly, eh? Ouch, that was painful! Blogger has a spam detector, now they need to start working on their pun detector! Pete Alvarado told me the name "Al McKimson" was short for "Alvarado McKimson," meaning him and Chuck. He said the two of them were the main artists. That sounds perfectly sensible. Always wondered about that 'Al' business, never made the connection. Thanks!